SanDisk Corp. today announced the addition of new card capacities to its Extreme III line of flash cards for professional digital cameras that are double the highest capacity points currently available. The new cards include the 8-gigabyte CompactFlash, 2GB SD and 2GB Memory Stick PRO Duo digital film cards. The announcement was made at the Photo Marketing Association trade show where SanDisk is demonstrating its products. 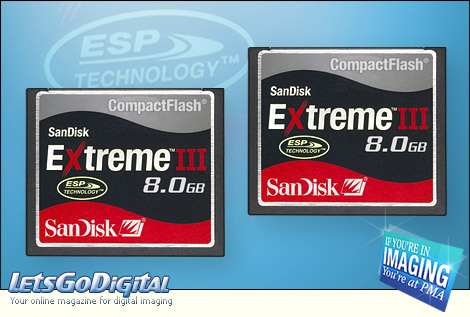 SanDisk Extreme III CompactFlash and SD cards have minimum write and read speeds of 20 megabytes per second (MB/sec.) Memory Stick PRO Duo cards have minimum write and read speeds of 18 MB/sec. The cards will start shipping worldwide in March to photo retailers. SanDisk Extreme III memory card - The SanDisk Extreme III cards, which range in capacity between 1- and 8GB are among the world's fastest working cards in many of today's leading digital single lens reflex (SLR) cameras. SanDisk Extreme III cards are targeted primarily at professional photographers who require high-speed flash memory storage cards for their high-performance digital SLRs. "Many photographers are wary of using cards that are larger than 1GB because they don't want to 'put all their eggs in one basket,' so to speak," said Jonathan Torgovnik, contract photographer for Newsweek magazine. "While that's a valid concern, I shoot RAW so using large capacity cards is a must. It also lets me concentrate on taking pictures rather than worrying about a pocket full of lower capacity cards that can easily be lost or misplaced." SanDisk 8GB Extreme III - Reliability, Performance and Capacity - Tanya Chuang, SanDisk retail product marketing manager, said, "The SanDisk Extreme III line offers professional photographers an ideal combination of reliability, performance and capacity to match their shooting and workflow requirements. These are the highest performance cards you can get in CompactFlash, Memory Stick PRO Duo and SD card formats." SanDisk Extreme III card - Enhanced Super-Parallel Processing - SanDisk Extreme III cards use SanDisk-developed ESP (Enhanced Super-Parallel Processing) technology that combines advanced NAND flash memory chips and controller designs, 32-bit RISC processing and leading edge algorithms for an architecture that streamlines every aspect of read and write data transfer operations. In addition, SanDisk works closely with major camera manufacturers to ensure speed and compatibility. The ESP architecture effectively removes the card as the bottleneck in data storage applications.